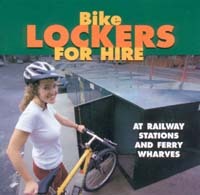 CAMWEST fully supports Bicycle NSW's bike locker scheme. The scheme seems to us one of the best ways to improve our air quality. It is short car trips, such as to the train station, that produce a lot of pollution. It also gives busy people the chance to do exercise on the way to work. We believe there should be lockers in Strathfield station. People in western Sydney could cycle to Parramatta along valley cycleway and through Homebush, park at the station, and catch a train from there to the city. This would involve a reasonable distance (15 Km from Parramatta, about 45 minutes) on mostly off-road tracks. Users would save on the train fair, while avoiding the inner city and the extra traffic. Strathfield is a big interchange station, which makes it an ideal target. Many people may already be changing trains at Strathfield, so they might be more inclined to cycle there. Lockers at Strathfield could attract people from the Hills area, Merrylands, and south of Strathfield, along the Duck River cycleway. Expand it to more stations, including Westmead. CAMWEST is proposing the Upper Parramatta River Catchment cycleway, linking the Hills area with Parramatta. This would let people ride to Westmead to catch the train, instead of driving and parking. It would also free-up some commuter car parking for others. CityRail should have more flexible, 'value-stored' train tickets, that give you, say, 100 trips. At the moment, if I buy a weekly/monthly, and ride two days per week, I'm wasting two trips. Have a reward for people that switch from car to bike. This would be good for CityRail, since they save money on parking. For example, offer people a free bike with free parking if they switch. Include smart card technology, and have lockers throughout CBDs, stations. The card would act as an electronic 'key'. That way it would be more flexible. Promote it specifically to people who drive to the station or to work at the moment. It seems that at the moment it‰s targeted at cyclists. Work hard at providing good cycleways to the station. Make it easy for employers to provide these lockers for their employees, at work. For example, in car parks of CBD buildings.